Little fans of Disney’s Minnie Mouse will love to practice role-play skills by selling bows and skirts in the shop downstairs, welcoming Daisy Duck and sitting outside at the table, and taking Minnie Mouse upstairs for a good night’s rest in the bedroom. Help them rebuild the model in lots of different ways to encourage imagination and develop fine motor skills. Includes two LEGO® DUPLO® figures, plus a cuckoo figure. Price is 15% below the initial Lego retail price, a € 7.15 discount! This comes down to 57.13 cent per brick. The Minnie Mouse Bow-tique (10844) Lego set is no longer directly available from the sites below. However, 3rd party partners of these sites might still have the set available. 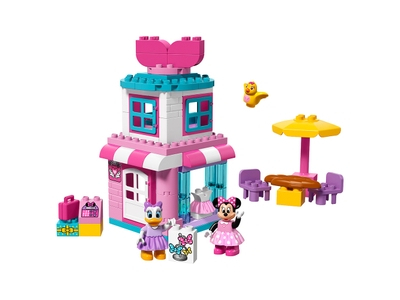 Alternate description Build and run the store with Disney’s Minnie Mouse and Daisy Duck!